CTIF officially has millions of members in 38 countries from Europe, North America and Asia, making it currently - at least on paper - the largest firefighting organisation in the world. The Mission of CTIF is to work to better understand, and continuously improve, the working conditions for firefighters through ongoing dialogue, analysis and sharing of Lessons Learned from incidents, accidents and fires throughout the world. CTIF prides itself as being an unprestigious organisation where Knowledge, Expertise and Passion for Firefighting means more than official titles, or whether a member is full time or volunteer. Most results are shared in the form of Reports, Manuals and Best Practices, free of charge. It is CTIFs ambition to continuously also work to share more digital material in the form New Media, Photography and Video presentations. Most of the active work within CTIF is carried out in Commissions & Working Groups, (Link to that section on the Home Page) consisting of members dedicated to a particular area of interest within Fire & Rescue. Currently there are 12 Commissions, and 3 working Groups, each governed by a Head of Commission and a Commission Secretary. As of 2017, CTIF is also working actively to start an Interior Firefighting Commission. Within each Commission, members meet regularly - either physically, virtually or both - to discuss and share their thoughts and expertise around current events, challenges and possibilities to improve working conditions for firefighters in the chosen area of interest. Work in the Commissions is volunteer based, usually with each member's local organisation or employer sponsoring with part of their regular working hours dedicated to CTIF work. During special circumstances CTIF or it´s corporate members can sometimes sponsor certain events and some travel. All Commission members work very closely with each other, on a first name basis, with little attention paid to titles or official formalia. Most active members are based in Europe. However, we are proud to also have the United States and Russia as active member countries, as well as recently South Korea, Japan and Iran. There has recently also been a keen interest from China to join our organisation. The CTIF Permanent Office (link to a page with contact info and a picture of the front desk, perhaps also of Simona) is currently located in Ljubljana, Slovenia since May 2017. Recent other host countries for the Permanent Office has been Sweden and Germany. CTIF’s decision organs are the Delegates’ Assembly (yearly meeting) and the Executive Committee. meets at least twice a year to follow up CTIF actions, projects and the work of CTIF commissions and to prepare proposals to be submitted to the Delegates’ Assembly. 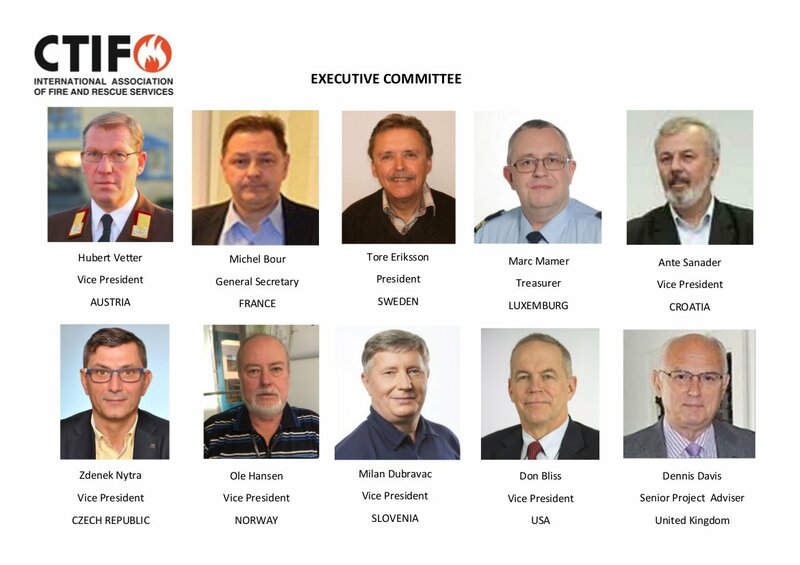 Next Delegates Assembly, will be be held in June 2018 in Las Vegas, in connection with NFPA´s yearly national meeting. This will be the first time in history where a CTIF Delegates´ Assembly will take place in the United States. "Safer Citizens Through Skilled Firefighters"